Friday is here! It means the weekend is coming and I couldn't wait. I felt so bored this week and hubby is still glued to his tons of job. When you do the same routines everyday for so many years, I think it is normal that you feel bored. Not complaining for the routines that I have to do for my family or being selfish about it, but I really need a break and I think I deserve that. Today's bento was a quick one again. It was easy to prepare and I hope those 2 little pandas didn't melt before the lunch time. I made it from cheese and nori, put them on the top of the rice balls. I put some middle wings fried chicken, sweetened red cherry, kani & edamame salad (dressing in the separate container, not pictured), carrot flowers, and 'egg noodle'. Psstt .... That egg noddle was actually omelet that I sliced thinly so looked like a noodle. Enjoy your day and wish everyone a great weekend ahead! Simple but fabulous! I like the way you arrange things in your bento, it looks beautiful. Yes Lia! All of us mommies deserve some day off! In fact I've been telling my hubby I wanted to take Annual Leave! hahahah I am thinking of a weekend (just myself) going down to Singapore for a good ME time! You keen? hehehheehe We can start planning! @Angeleyes : Hey! I'm actually will back to Singapore 20-22 May to watch Lion King Show with the kids. Meet up? hubby when he's home tomorrow! Everyone deserves a break every now and then! You should take some time to unwind and relax, then do something really fun! I love your egg noodles!!! Ah Lia, enjoy and take advantage of those boring weeks! Sometimes, it's just good to be able to enjoy the time and veg out. lol. I need a boring week, let's trade! I also love the way you present and pack your bentos. So pretty. Have a wonderful weekend Lia.. enjoy enjoy! @ChantaleP : OK, deal! Let's trade lol ... Thanks a lot Chantale! I feel better after read your sweet comment :) Have a wonderful weekend too! I am also glad that it's weekend, I need a break from my job ;)! Well, at least I know how to appreciate my weekend now. Your bento is again adorable, they always make me ohhh and ahhh...;). I love the egg ribbons! I never thought to try that. Love your Bentos! I've put you on my homepage. Could you tell me how you make those gorgeous colored egg sheets? I'm in awe. Hope you will get some great time this weekend! 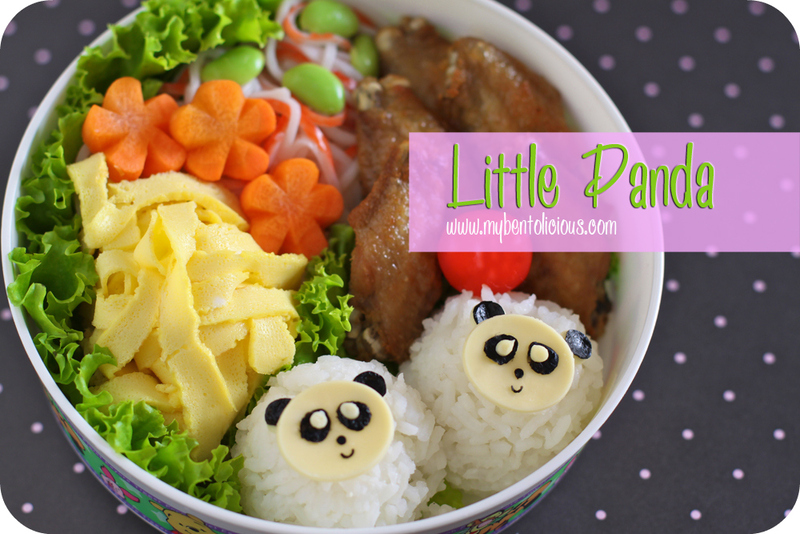 I love panda and your bento pandas are so cute! @sheri fujihara chen : Thanks a lot Sheri! Kids love egg noodles, they said it was fun way to eat egg :) Enjoy your weekend too Sheri! @Wendy : Thanks a lot! You can click on the Tips section at the top. I posted about how to make the colored egg sheet. Have fun! @Design Elements : Thanks a lot! so sweet panda...Hope you had enjoyed your weekend? Love d two cute panda face! agree with mama elaine, your bentos arrangement are always attractive & appetizing. keep-it up & take time off to pamper yourself. enjoy!